Mini-combs perform the same job as a flicker, with the additional benefit of separating out the long and short fibers, producing true top. 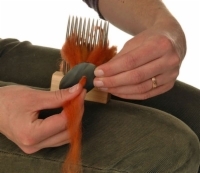 They can comb fibers as short as 2 inches, and also separate out coarse guard hair from the shorter undercoat fibers in bison or qiviut. 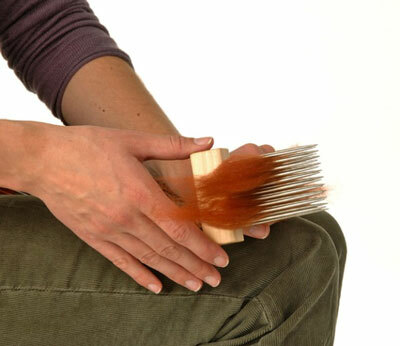 1Use your left hand to hold one comb in your lap, with the tines facing up. Place the fiber that you want to comb over the tines. Be sure the tips face away from the handle. 2Turn the comb so that the tines face away from your body. As with flicking, you can comb in the grease, but it is better to wash the locks first. You can cut any sun-bleached or weak tips off with scissors. 3Bring the right comb up and swing it down through the fiber. Let the weight of the comb do the work. 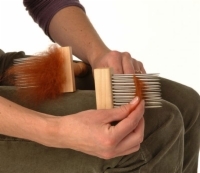 The fiber transfers from the left comb to the right comb. 4When most of the fiber is transferred, pull the waste fiber out of the left comb and set it aside. In woolen processing, the fiber is opened up and spread into an even batt. This batt is then rolled to help ensure that the fibers are all crossed. 5Change combs. 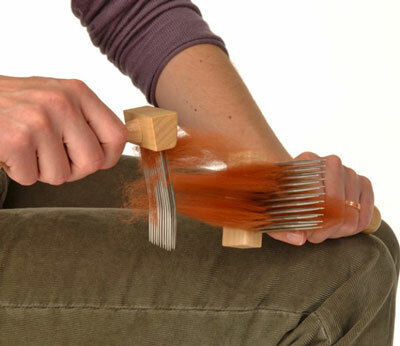 Place the comb holding the fiber on your lap, and use the empty comb to repeat the combing process. You may need to do three or four passes to clean out the fiber. 6You can spin the fiber right from the comb. 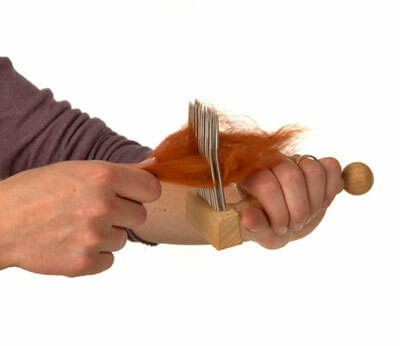 Hold the comb in the hand in which you would normally hold the fiber. Draft up toward the wheel using a worsted technique. You usually prepare fiber for woolen spinning using either hand cards or a drum carder. Commercial producers use the same method, but on a much bigger carder. 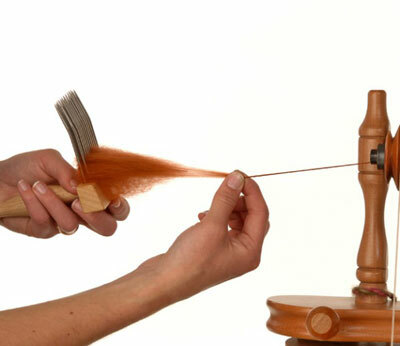 When fiber has been carded rather than combed—as it would be for worsted spinning—it is called roving. 7Draft the fiber out until it stops pulling easily. Set aside the remaining short fibers. If they are reasonably free of chaff, they can be carded together with either hand cards or a drum carder to make a woolen yarn. When you draft, you pull the fiber out of the fiber bundle into the diameter you need for the size yarn you are making.